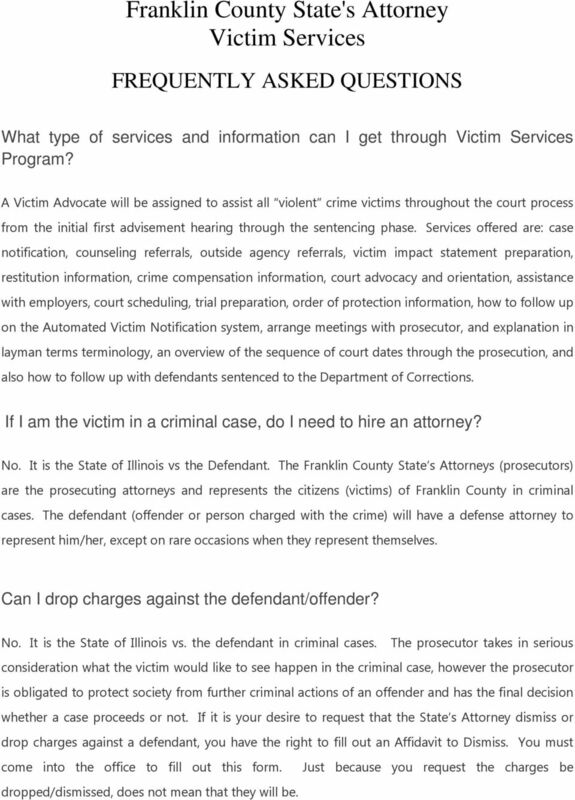 Download "Franklin County State's Attorney Victim Services"
1 Franklin County State's Attorney Victim Services FREQUENTLY ASKED QUESTIONS What type of services and information can I get through Victim Services Program? A Victim Advocate will be assigned to assist all violent crime victims throughout the court process from the initial first advisement hearing through the sentencing phase. Services offered are: case notification, counseling referrals, outside agency referrals, victim impact statement preparation, restitution information, crime compensation information, court advocacy and orientation, assistance with employers, court scheduling, trial preparation, order of protection information, how to follow up on the Automated Victim Notification system, arrange meetings with prosecutor, and explanation in layman terms terminology, an overview of the sequence of court dates through the prosecution, and also how to follow up with defendants sentenced to the Department of Corrections. If I am the victim in a criminal case, do I need to hire an attorney? No. It is the State of Illinois vs the Defendant. The Franklin County State s Attorneys (prosecutors) are the prosecuting attorneys and represents the citizens (victims) of Franklin County in criminal cases. The defendant (offender or person charged with the crime) will have a defense attorney to represent him/her, except on rare occasions when they represent themselves. Can I drop charges against the defendant/offender? No. It is the State of Illinois vs. the defendant in criminal cases. The prosecutor takes in serious consideration what the victim would like to see happen in the criminal case, however the prosecutor is obligated to protect society from further criminal actions of an offender and has the final decision whether a case proceeds or not. If it is your desire to request that the State s Attorney dismiss or drop charges against a defendant, you have the right to fill out an Affidavit to Dismiss. You must come into the office to fill out this form. Just because you request the charges be dropped/dismissed, does not mean that they will be. 3 a victim and have not received a form letter or call from our office, you can contact our office at (618) and ask to speak to an advocate. To better assist you, please call with as much information as possible; name of defendant and case number. 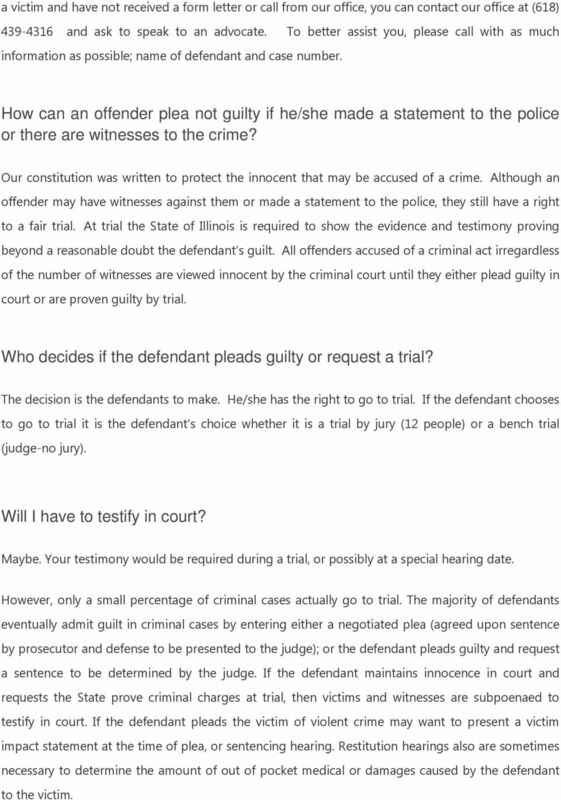 How can an offender plea not guilty if he/she made a statement to the police or there are witnesses to the crime? Our constitution was written to protect the innocent that may be accused of a crime. Although an offender may have witnesses against them or made a statement to the police, they still have a right to a fair trial. At trial the State of Illinois is required to show the evidence and testimony proving beyond a reasonable doubt the defendant s guilt. All offenders accused of a criminal act irregardless of the number of witnesses are viewed innocent by the criminal court until they either plead guilty in court or are proven guilty by trial. Who decides if the defendant pleads guilty or request a trial? The decision is the defendants to make. He/she has the right to go to trial. If the defendant chooses to go to trial it is the defendant s choice whether it is a trial by jury (12 people) or a bench trial (judge-no jury). Will I have to testify in court? Maybe. Your testimony would be required during a trial, or possibly at a special hearing date. However, only a small percentage of criminal cases actually go to trial. The majority of defendants eventually admit guilt in criminal cases by entering either a negotiated plea (agreed upon sentence by prosecutor and defense to be presented to the judge); or the defendant pleads guilty and request a sentence to be determined by the judge. If the defendant maintains innocence in court and requests the State prove criminal charges at trial, then victims and witnesses are subpoenaed to testify in court. If the defendant pleads the victim of violent crime may want to present a victim impact statement at the time of plea, or sentencing hearing. Restitution hearings also are sometimes necessary to determine the amount of out of pocket medical or damages caused by the defendant to the victim. 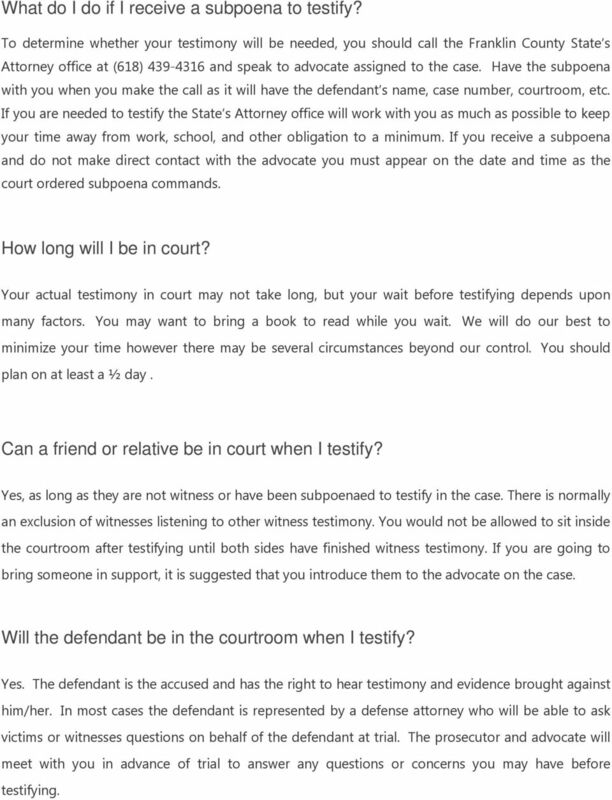 4 What do I do if I receive a subpoena to testify? 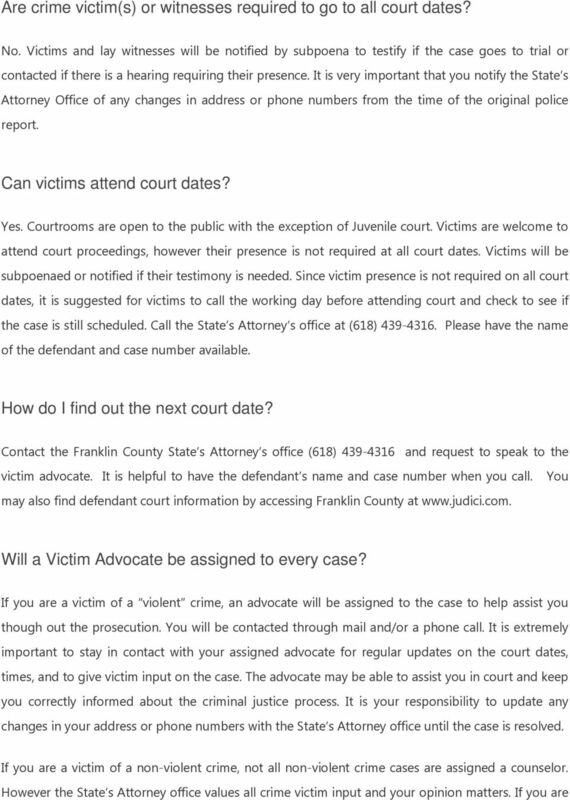 To determine whether your testimony will be needed, you should call the Franklin County State s Attorney office at (618) and speak to advocate assigned to the case. Have the subpoena with you when you make the call as it will have the defendant s name, case number, courtroom, etc. If you are needed to testify the State s Attorney office will work with you as much as possible to keep your time away from work, school, and other obligation to a minimum. If you receive a subpoena and do not make direct contact with the advocate you must appear on the date and time as the court ordered subpoena commands. How long will I be in court? Your actual testimony in court may not take long, but your wait before testifying depends upon many factors. You may want to bring a book to read while you wait. We will do our best to minimize your time however there may be several circumstances beyond our control. You should plan on at least a ½ day. Can a friend or relative be in court when I testify? Yes, as long as they are not witness or have been subpoenaed to testify in the case. There is normally an exclusion of witnesses listening to other witness testimony. You would not be allowed to sit inside the courtroom after testifying until both sides have finished witness testimony. If you are going to bring someone in support, it is suggested that you introduce them to the advocate on the case. Will the defendant be in the courtroom when I testify? Yes. The defendant is the accused and has the right to hear testimony and evidence brought against him/her. In most cases the defendant is represented by a defense attorney who will be able to ask victims or witnesses questions on behalf of the defendant at trial. The prosecutor and advocate will meet with you in advance of trial to answer any questions or concerns you may have before testifying. 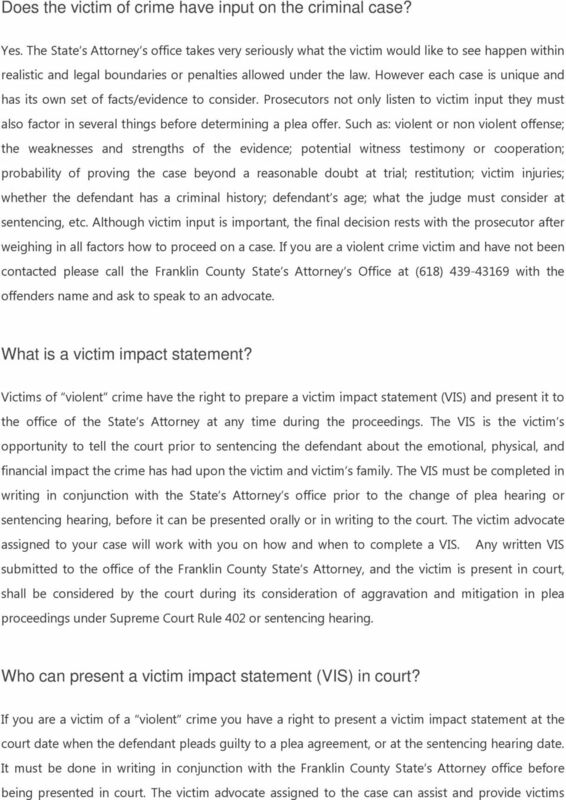 8 How many victim impact statements can be presented in court? 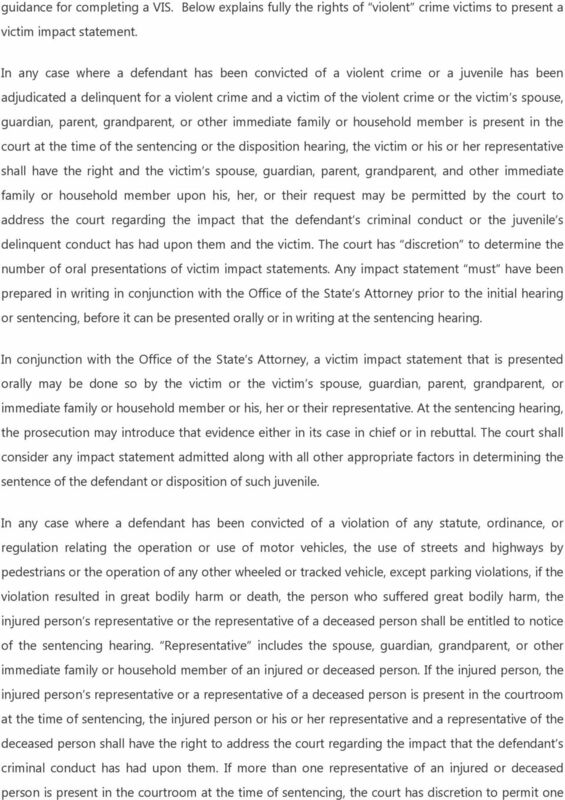 In any case where a defendant has been convicted of a violent crime and a victim of the violent crime or the victim s spouse, guardian, parent, grandparent, or other immediate family or household member is present in the courtroom at the time of the sentencing or the disposition hearing, the victim or is or her representative shall have the right AND the victim s spouse, guardian, parent, grandparent, and other immediate family or household member upon his, her, or their request may be permitted by the court to address the court regarding the impact that the defendant s criminal conduct has had upon them and the victim. All statements MUST be done in writing in conjunction with the State s Attorney office. The court has discretion to determine the number of oral presentations of victim impact statements. Contact the victim advocate assigned to your case for assistance. 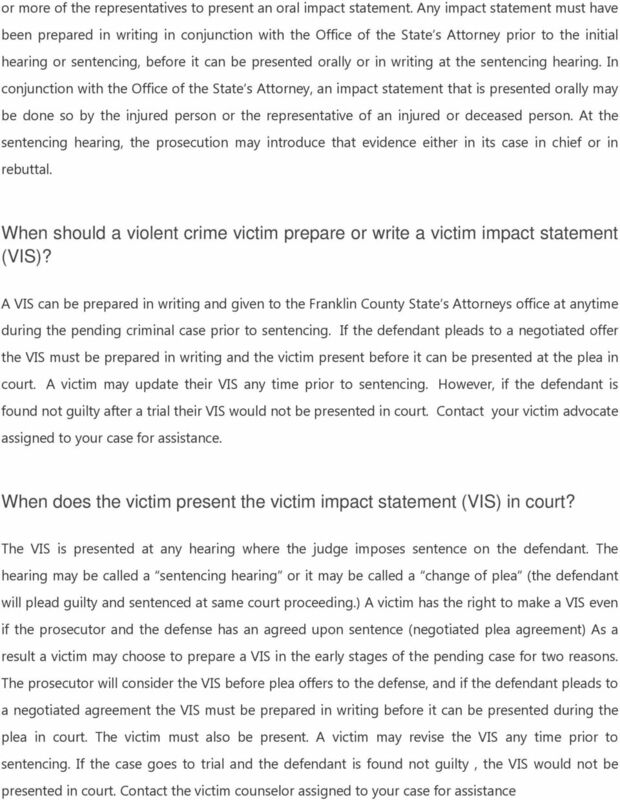 Is a violent crime victim required to complete a victim impact statement? No, it is not required. It is strictly a personal choice of the victim. It is an opportunity for the victim to have a voice and address the court about the emotional, physical, and financial impact the crime has had upon the life prior to the court sentencing the offender. You may want to speak to the victim advocate assigned about whether or not completing a VIS feels right to you. 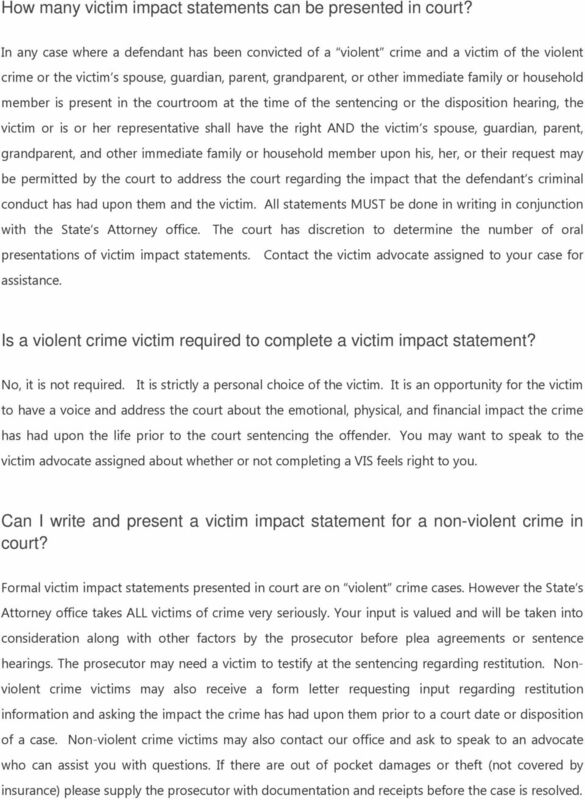 Can I write and present a victim impact statement for a non-violent crime in court? Formal victim impact statements presented in court are on violent crime cases. However the State s Attorney office takes ALL victims of crime very seriously. Your input is valued and will be taken into consideration along with other factors by the prosecutor before plea agreements or sentence hearings. The prosecutor may need a victim to testify at the sentencing regarding restitution. Nonviolent crime victims may also receive a form letter requesting input regarding restitution information and asking the impact the crime has had upon them prior to a court date or disposition of a case. Non-violent crime victims may also contact our office and ask to speak to an advocate who can assist you with questions. If there are out of pocket damages or theft (not covered by insurance) please supply the prosecutor with documentation and receipts before the case is resolved. 9 Is there money to help cover medical expenses as a result of violent crime committed against me? 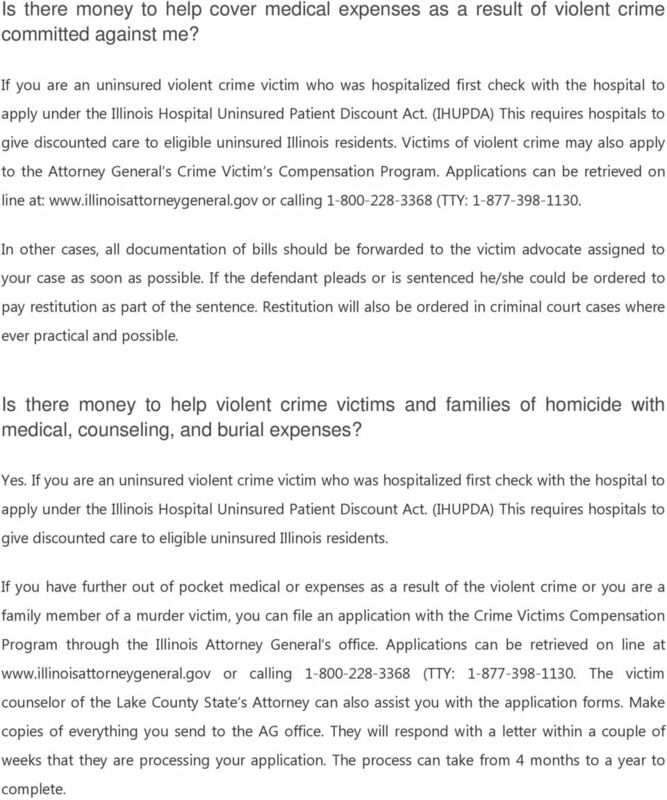 If you are an uninsured violent crime victim who was hospitalized first check with the hospital to apply under the Illinois Hospital Uninsured Patient Discount Act. (IHUPDA) This requires hospitals to give discounted care to eligible uninsured Illinois residents. Victims of violent crime may also apply to the Attorney General s Crime Victim s Compensation Program. Applications can be retrieved on line at: or calling (TTY: In other cases, all documentation of bills should be forwarded to the victim advocate assigned to your case as soon as possible. If the defendant pleads or is sentenced he/she could be ordered to pay restitution as part of the sentence. Restitution will also be ordered in criminal court cases where ever practical and possible. Is there money to help violent crime victims and families of homicide with medical, counseling, and burial expenses? Yes. If you are an uninsured violent crime victim who was hospitalized first check with the hospital to apply under the Illinois Hospital Uninsured Patient Discount Act. (IHUPDA) This requires hospitals to give discounted care to eligible uninsured Illinois residents. If you have further out of pocket medical or expenses as a result of the violent crime or you are a family member of a murder victim, you can file an application with the Crime Victims Compensation Program through the Illinois Attorney General s office. Applications can be retrieved on line at or calling (TTY: The victim counselor of the Lake County State s Attorney can also assist you with the application forms. Make copies of everything you send to the AG office. They will respond with a letter within a couple of weeks that they are processing your application. The process can take from 4 months to a year to complete. 10 What is the Attorney General s Crime Victim Compensation Program and who is eligible? 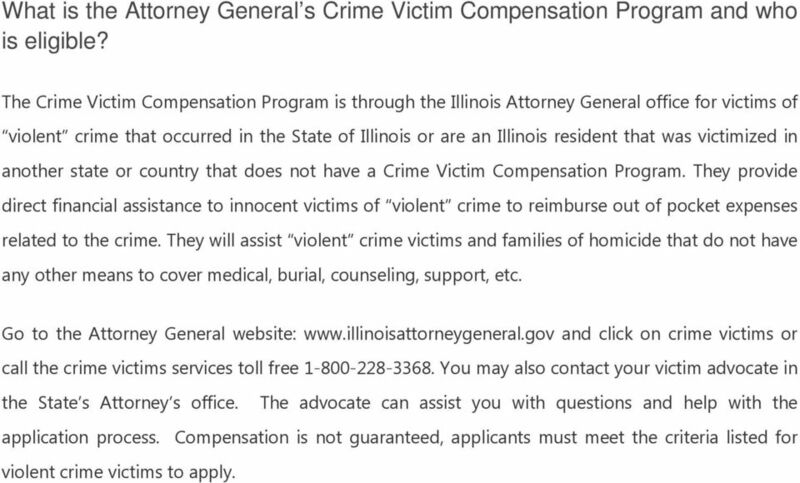 The Crime Victim Compensation Program is through the Illinois Attorney General office for victims of violent crime that occurred in the State of Illinois or are an Illinois resident that was victimized in another state or country that does not have a Crime Victim Compensation Program. They provide direct financial assistance to innocent victims of violent crime to reimburse out of pocket expenses related to the crime. They will assist violent crime victims and families of homicide that do not have any other means to cover medical, burial, counseling, support, etc. Go to the Attorney General website: and click on crime victims or call the crime victims services toll free You may also contact your victim advocate in the State s Attorney s office. The advocate can assist you with questions and help with the application process. Compensation is not guaranteed, applicants must meet the criteria listed for violent crime victims to apply.